How to be there when you can't be there. — RINGLEADER paper co. When my husband was doing a lot of traveling for work, I slipped notes into his suitcase to surprise him when he unpacked in his hotel room. Most of the time the note was short, something along the lines of I was going to miss him and loved him. If he was traveling for a meeting or a sales opportunity, I'd wish him luck. I wanted him to know I was with him in spirit even though I wasn't physically there. 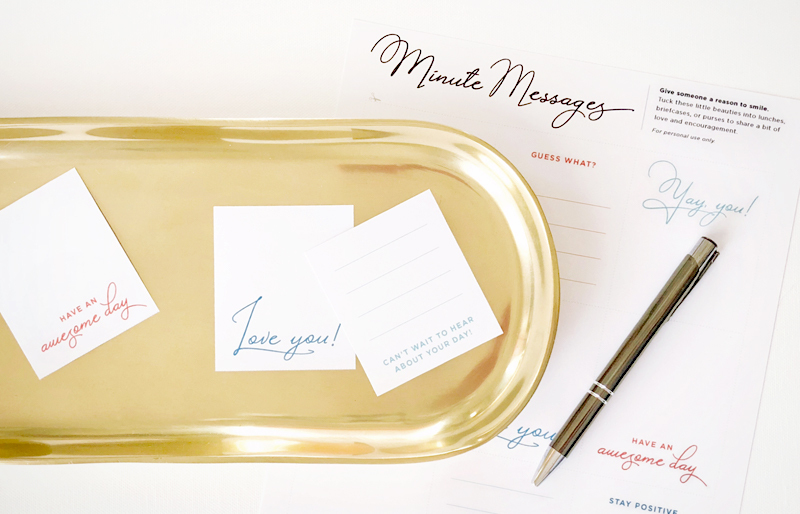 A note is a simple idea, but one that can mean a lot to the person who receives it, especially if it's unexpected. Do you have a child who has to give a presentation at school or has a test they've been studying for? Slip a note in their lunch or backpack saying you think they'll do great. Or simply let them know you can't wait to hear about their day. A little bit of encouragement can go a long way. The more they know you're there for them with support and love, the more confident they will become. This won't cost you anything but a minute of your time. I created a simple message sheet that I could print to have quick access to nine little notes on one sheet. They're a great way to send a little of myself along with my loved ones as they go about their day. In fact, they've worked so well for me, I'd like to share them with you. The best part? It won't cost you anything but a minute of your time. (My husband actually left one at my desk before he left for work in the morning, and it made my day!) I call them Minute Messages because they really only take a minute to print and trim out. One minute of your time gives someone a smile that lasts so much longer! You're welcome to print out them as much as you'd like, but please use it for personal use only. I'm all for sharing. How about you? What little things do you do to let someone know you're thinking of them? Have you left a loved one a note? What creative ways have you used them? Please share in the comments below. I'd love to read how you're there for loved ones when you can't be there! If you know someone who would like to be more present in their family's day, please share this post and encourage them to sign up for our newsletter. We'll share other free goodies, ideas for connecting with the people you care about, awesome new products (there are some great ones coming soon! ), and you'll be among the first to hear about special deals and promotions. Let's make the world a happier place, one smile at a time! Exciting things are happening in our stationery store. Pushing the Boundaries: Creative Digital Image-Making.